“Wow you look just like your mother?” This might be taken as an insult or compliment depending on who is saying it. In this case Alex’s mother is being mistaken as her daughter. 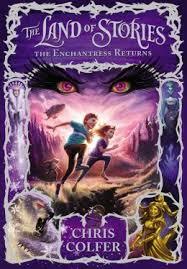 The Land of Stories: The Enchantress Returns is all about the mistakes that are made throughout this novel. The main characters, Alex and Conner are once again in the fairy-tale world; however, this time it was not by accident.The conflict started with the twins mother Charlotte being kidnapped on the day of her engagement to a young doctor named Bob, with whom she had worked with at the hospital. The two had been in a very happy marriage until they each lost their spouse’s. An example of a character vs. self conflict is they had both been extremely depressed until they found each other. At first, Alex and Conner were shocked because she had been keeping the secret of herself seeing someone for almost eight whole months. But the twins were still extremely happy for their mother because she had finally been happy. One of the other characters in this wonderful novel is their grandmother, the Fairy Godmother, the same fairy that had turned a giant pumpkin into a carriage for Cinderella. The plot thickens on the day of the engagement, when Charlotte was kidnapped by the Enchantress. Why you may ask? This is a character vs. character conflict because the Enchantress is planning revenge against the Fairy Godmother for booting her out of the Fairy Council. Chris Colfer is the author of the second book in The Land Of Stories trilogy. Colfer’s novels contains adventurous twins Alex and Conner. The author has an astounding writing manner of transforming classic fairy tales into real life adventures. Each and every single page becomes more interesting and deeper and deeper into fairy tale stories. Colfer is an actor/author starring on a hit television show on Fox called Glee. His personal values touch every reader’s heart. Chris’s grandmother would always read fairy tales to Chris, which is how he was inspired to writing. Chris once said “ he couldn’t have written this trilogy without her.” Chris’s dream in the future is to see a new generation admire the work of fairy tales, just as much as he still looks up to them today. Each and every person alive can relate to this story, and Chris does a fantastic job of showing that to his readers.